Lorex DV900 Series DV9163 16 Channel 4K HD MDX 3TB DVR Security System with 16 1080P LEV2712B Dome Cameras! Secure what matters with this complete, easy-to-install, Lorex HD 1080p security monitoring system. Containing the Lorex 16-channel DV900 digital video recorder (DVR) and 16 Lorex LEV2712B HD weatherproof dome security cameras, this home security system from Lorex will provide you with top-of-the-line HD video footage. Remain vigilant with excellent night vision and best-in-class image quality. The Lorex LEV2712B HD dome security camera and the Lorex DV900 DVR combined can produce stunning 1080p high definition video that leaves nothing to question. With wide 90° fields of view, your 16 Lorex 1080p dome security cameras are well-suited to protect any type of property. 30 frames-per-second (720p mode) recording ensures smooth on-screen movement so every moment is captured. The included HDMI cable easily connects the HD security DVR to an HDTV or HD monitor so you can create a handy security station for accessing your home security system locally. Lorex is proud to provide customers with do-it-yourself home security systems. The Lorex MPX1616D security system is no exception. Connection between your DVR and each security camera is accomplished by a single RG59 siamese BNC cable that carries both video and power. This plug-and-play set-up will have your security system up and running in no time. 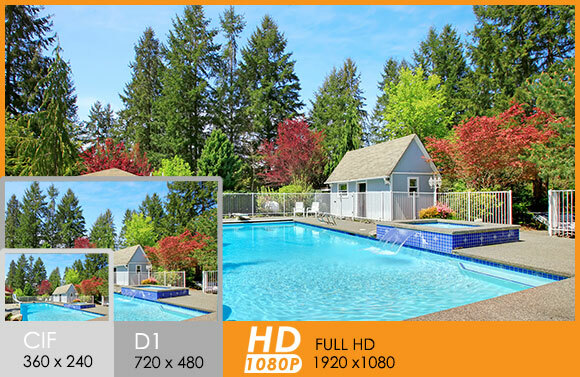 Analog HD cameras like the LEV2712B HD security camera can be installed up to 800 feet away from the DVR – making them the perfect option for large properties (see documentation for complete details). The exclusive Lorex MPX1616D security system is designed to be used with our solution for securely viewing your security system over the internet. Without recurring fees and a simple 3-step set-up, the free Lorex Cloud™ app enables you to consolidate your entire security system from your mobile device or computer. See what your cameras see (or watch playback recordings) from virtually anywhere in the world. Be aware of any important developments by programming your DVR to send you push notifications and instant email alerts (with snapshot attachments) for motion-triggered alerts. With a night vision range that allows you to clearly see up to 130ft / 40m away in ambient lighting and up to 90ft / 28m away in total darkness, the Lorex LEV2712B HD dome security cameras will have you covered throughout the night. ClearNight imaging technology generates superior low light performance and improves recording efficiency. Close up recognition of objects in the dark is provided through SmartIR technology. These amazing features make sure that you won’t ever be left in the dark. There’s no need to ever worry about your Lorex security cameras. Manufactured with an IP66 rating, these rugged security cameras are fully weatherproof – they can even continue to operate in extreme temperatures as low as -22°F (-30°C). Their friendly compact designs allow them to be placed wherever you may need them most – indoors or outdoors. Delivering high quality performance, efficiency, and reliability, the 3TB security certified hard drive within the Lorex DV900 HD DVR will safely store weeks (or even months) of footage. Not your ordinary HDD, this hard drive can work all day and night without a break – it can even continue to record while you watch recorded footage. Customize your DVR to record at a lower resolution or program scheduled recording times to save hard drive space. The option to record only when movement is detected can save even further hard drive space.